United States Alfalfa hay is used both domestically and world wide as the basis of a healthy Dairy/Beef cow and horse diet. More and more this high protein and high fiber feed option is finding a home overseas feeding other animals such as goats, sheep, Camels, and pigs. Alfalfa can be grown throughout the world as forage for cattle and specific horse needs, and is harvested mostly as a hay product. 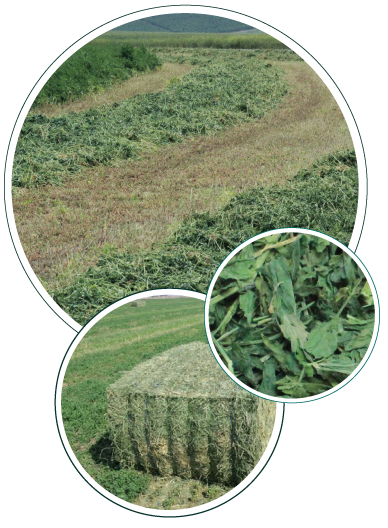 Alfalfa can also be made into silage, grazed on, or fed as green chop. 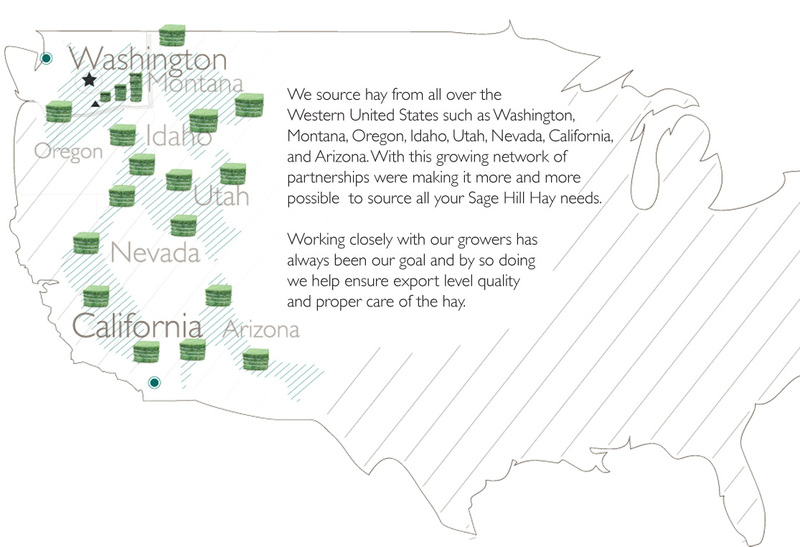 Properly harvested western United States alfalfa has high feeding value, relative to other common hay crops. When alfalfa is grown on soils where it is well adapted, alfalfa is often the highest-yielding forage plant. In most climates, alfalfa is cut three to four times a year, but it can be harvested up to 12 times per year in the southwestern part of the United States. Total yields are typically around eight tons per hectare (four short tons per acre) in temperate environments, but yields have been recorded up to 20 T./ha (16 tons per acre)”. Although alfalfa hay is baled in a variety of sizes and shapes (such as round bales) we focus primarily on twine bound square bales. These bales come in many sizes and are wrapped using anywhere from 3 strings up to 6 strings. The term square is used loosely. The exact sizes are more rectangular than square. Big Bale is a general term for large bales where machinery is necessary for the handling and transportation of even one bale. The raw product bale that is most common for export customers is packaged at the field in 3'x3', 3'x4' and 4'x4' x 8' sizes. 3'x3' Bale: This type of bale size is a little more challenging to stack and press however we do source this baled size of hay for our customers. These bales weigh roughly 1000 lbs each. 3'x4' Bale: This is a very common size of bale here in the western United States. The specs on these are 4’ wide x 3’ tall x 8’ long and weigh about 1400 Lbs. 4'x4' Bale: Also very common when sourcing hay in the western United States it‘s 4’ wide x 4’ tall x 8’ long and can weigh as much as 2000 Lbs­,—though an average weight is more like 1750 Lbs.